Creating a new website for your small business can be a daunting task … what sort of look/type of functionality is going to work best for you, what is your budget and how do go about selecting a web design company? Generally, the first step is to take a look at what other similar business are doing…just to get some ideas and your own creative process rolling. If you find a site you absolutely love, it doesn’t do any harm to contact the web design company who created it – many design companies include a “designed by” link at the footer of the site…these are often quite small. 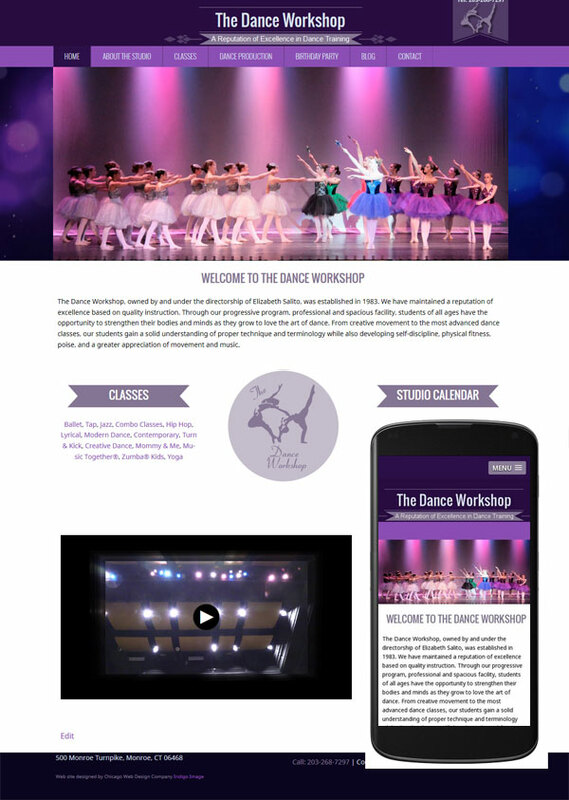 This is exactly how we connected with one of our newest clients, The Dance Workshop, a dance studio located in Monroe CT. They had seen a site we created for a Chicago based dance studio and reached out to us, the rest is history! This week sees the launch of their new WordPress website. One of the main things they wanted to achieve with their new site was the ability to update it and this was easily achieved by building on the WordPress platform. We created a completely new look which offers and engaging experience to the user with plenty of photographs and information and is of course mobile friendly. It is always interesting to look back and see the improvements..here is their original site. This entry was posted in Web Design Projects, Wordpress. Bookmark the permalink.